It is difficult to take accurate measurements of the elastic modulus when it comes to thin films, because of what is called the substrate effect. In general, the depth of indentation is limited to 10% of the thickness of the coating, to avoid any contribution to the measured mechanical properties by the effect of the substrate. However, this is very hard to ensure especially in films less than 200 nm thick. The Oliver-Pharr model is not universally applicable to the calculation of elastic modulus, due to many factors, including the radius of the indenting tip and the roughness of the indented surface. The advanced ultra-low-noise xProbe™ transducer is used with the Intrinsic Thin Film Property Solution (iTF) in such situations, offering quantitative measurements of the mechanical behavior of thin films only 10 nm thick, using nanoindentation technology. Sample diagram of a 10 nm thick ultra-thin film on a silicon substrate. 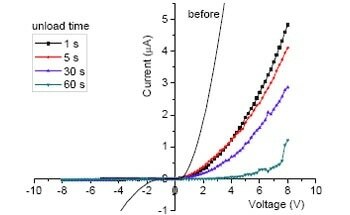 This experiment was performed using the Hysitron® TI 950 TriboIndenter® (from Bruker) in combination with a fitted xProbe and a cube-corner probe in quasi-static mode. The xProbe is a transducer based upon MEMS. 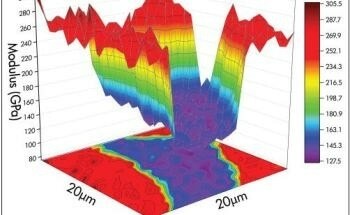 Its noise floor is comparable to that of a contact mode atomic force microscope (AFM). The linear actuator model permits direct measurements which are fully quantitative in nature, but avoids the need for modeling, thus arriving at more accurate results in respect to the mechanical properties and having a higher analysis throughput. As Figure 1 shows, nanoindentation tests were carried out in load control feedback mode, on the ultra-thin-film sample. Figure 1. 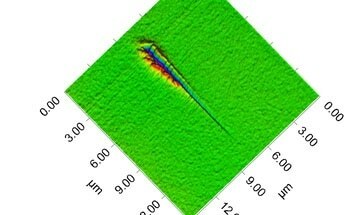 Representative load-displacement nanoindentation curves of a 10 nm ultra-thin-film with an xProbe. Figure 2. Reduced elastic modulus and hardness are plotted in terms of nanoindentation penetration depth. The interface between the film and substrate can be seen in the graph shown as the dash-dot-line. The estimated film modulus analyzed by iTF analysis is marked in the shadowed area (300 GPa). The approximation of the reduced elastic modulus of the whole system is marked as the dash-line. Where S is the unloading stiffness and A is the projected contact area. The hardness values and elastic modulus are used to generate a plot as a function of contact depth, as shown in Figure 2. The early increase in mechanical properties is attributed to the roughness of the surface and the interfacial layer. When the iTF analysis is applied to the stiffness, depth, and load profile, it gives an immediate calculation of the film’s intrinsic elastic modulus. This type of analysis uses a function of known area, contact geometry, stiffness and load as input values in all the three equations between the elastic deflection and the contact radius. The difference between iTF analysis and finite element analysis is the lack of any necessity to adopt a presumed modulus for the thin film. A simple numerical solution for the three equations yields the film modulus, shown in Figure 2, and the plasticity. When the ultra-low-noise xProbe transducer and the iTF analysis are combined, it is possible to calculate the elastic properties of ultra-thin-film systems measuring 10 nm or below in thickness. 1. Li, H. and J.J Vlassak, Determining the elastic modulus and hardness of an ultra-thin film on a substrate using nanoindentation. Journal of Materials Research, 24,1114–26, 2009. 2. Oliver, W.C. and G.M Pharr, An improved technique for determining hardness and elastic modulus using load and displacement sensing indentation experiments. Journal of Materials Research, 7, 1564–83, 1992. This information has been sourced, reviewed and adapted from materials provided by Bruker Nano Surfaces. 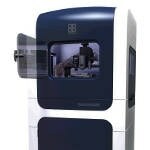 For more information on this source, please visit Bruker Nano Surfaces.